LAS VEGAS, Nevada – CEO Ed Soares announced today that the main event of LFA 64 will now be for the undisputed lightweight championship when the promotion returns to South Dakota in two weeks. 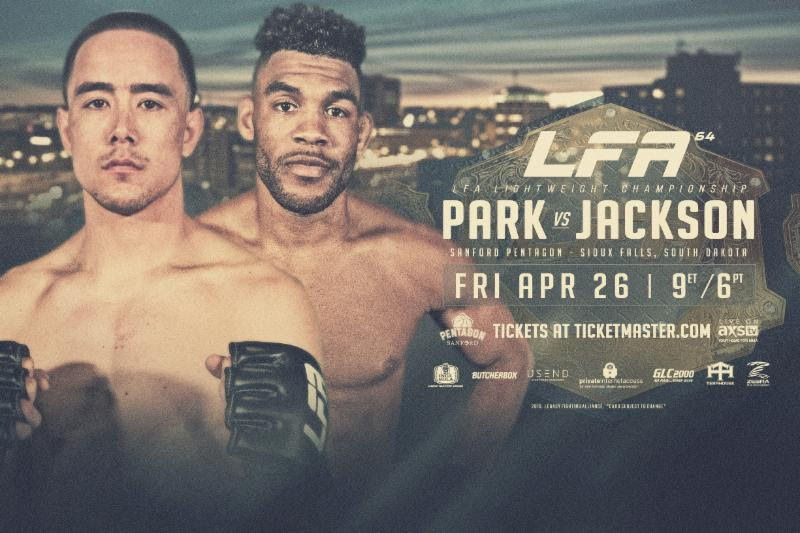 LFA 64 – Park vs. Jackson takes place Friday, April 26th at the Sanford Pentagon in Sioux Falls, South Dakota. The entire main card will be televised live and nationwide on AXS TV at 9 p.m. ET / 6 p.m. PT. Tickets for LFA 64 – Park vs. Jackson are available for purchase NOW at Ticketmaster.com. Park (11-2) is a U.S. Navy veteran and Curry County Sheriff’s Deputy from Clovis, New Mexico. He made his LFA debut last May in the high altitude of Vail, Colorado. Park fought Austin Hubbard in a back-and-forth fight, but Hubbard won the decision. That earned Hubbard a title shot, which he won to become champion. Park used that fight as motivation. He won his next two fights in emphatic fashion, including one of the most memorable fights of 2018. After suffering a compound fracture to his right ring finger in the first round of his fight against Le’Ville Simpson at LFA 53, the “Fightbot” cruised to a dominant win in Arizona with the bone protruding. Two months later, Park stopped Jaleel Willis via first round TKO in the main event of LFA 58 in his home state of New Mexico. The lively lawman now has his sights set on LFA gold. Jackson (10-2) will be returning to the venue where he announced his arrival to the promotion and the global MMA scene twelve months ago at LFA 37. The Hard Knocks 365 product flew in from south Florida like a hurricane last spring. He only needed 1 minute and 48 seconds to blow away Hamilton Ash in the first round with a highlight reel knock out. The man known as “Scrap Iron” picked up another win over Bryce Logan in Bellator only to return to the LFA Octagon with another stunning first round finish in December. Jackson showed off his submission game by tapping Bobby Lee via Guillotine Choke in the co-main event of LFA 56. The dynamic lightweight looks to stay hot when he meets a man that made his LFA debut just two weeks after him in 2018. 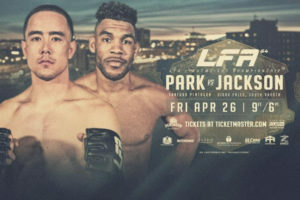 Jackson returns to Sioux Falls at LFA 64. This time on a quest for LFA gold.